Wicca Spells is a central source of knowledge and it is gathering information on genuine Wicca rituals, Spells, Sabbats and general Witchcraft. 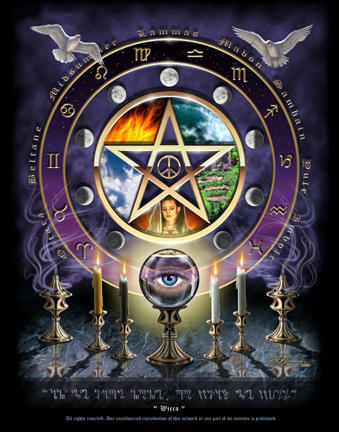 If you are interested in Wicca Spells, Wiccan Spells, Witchcraft Spells, Wicca Spells, Witch Spells, Magic Spells – You’ve come to the right place. We intend to cover many aspects of witchcraft as well as astrology, including the twelve signs which are Aries, Libra, Taurus, Scorpio, Gemini, Sagittarius, Cancer, Capricorn, Leo, Aquarius, Virgo and Pisces. We will be giving out free spells every so often when we update the website, so there will be always something new every time you visit us. Be sure to do so. Since our speciality is within Love Spells, Wiccan Spells and Witch Spells we would be updating it more frequently with more indepth information. We do, however, still give information and methods on other types of spells including black magic, wiccan magick, pagan beliefs and how to choose one, spell casting in general, and so much more. Let this website be a guide to the starting witch, to the new spell casters, to those who are interested in all sorts and forms of magic and spells. Try out some spells – but with full precaution and understanding of your actions. Don’t forget to subscribe to our Spell News newsletter, to get the latest premium spells in your email box, with new articles and information on Wicca. You can join our facebook page for updates and talk about everything that has to do with Wicca, Wiccans and Witches. I have handcrafted this special pentagram and have applied a unique guardian spell on it. 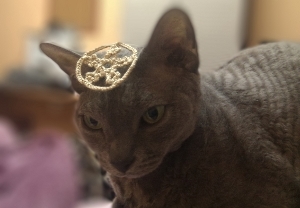 My cat is a British Devon Rex and hadn’t been feeling too good – had a problem with the stomach. I had to do something, because I love this cat very much! After a week he got much better! I’m still wondering if I should make a few more of these Wiccan pentagrams. What do you guys think? You can comment via email or via my facebook page. 1. In Wicca there is a hierarchy (I am talking about classic Wicca, namely Old Faith). In coven (Wicca Organization) there are usually primary priest or priestess. They head the Sabbaths (Wheel of the year holiday). 2. In Wiccan texts there is a direct reference to the ethical standards (a commandment), which is bound by a witch (if she is good). 3. In Wicca there are canons of “netting” spells, as We believe that we should follow our route, drawing on the experience of those who went before us. 4. Wicca is very tolerant to other religions, as they believe that all gods are one of the incarnations of the Great Spirit. 5. Old Faith rejects violence. The origins of the religion dates back to the days when the main power in the society was in women hands. The women understand the value of life, as they brought a new life. The law clearly states that a witch, that preaches Wicca should not kill. She can do so only on two occasions as motivated by hunger (this applies to animals) and in the event of an attack. 6. The moral of Wicca is very different from Christian. We (wiccans) do not accept slave obedience to God, as in most prayers of the Bible, a direct reference to the absolute god. Gods are our parents, not owners. They need love, not subordination. 7. Wiccan would not suggest other cheek when it get hit. Although we do not accept violence, but self-defense is acceptable! 8. We are not alien to human joy. 10. We do not accept the deliberate destruction of the body (to the issue of drugs, smoking and alcohol, which destroys the body). Yes, we use wine in their ceremonies, but this is happens eight times a year, and it is a very small portion. The wine in small doses provides therapeutic effect (it is that small). Yet, it should be noted that Neo Wiccans replace the wine with various juices, which is also acceptable. 11. Wiccans believe in reincarnation, that is, that our souls after the death of the body (shell) does not die, and after a short rest will return to the earth to live again, but in a different body. Sometimes, the soul enters the country eternal summer, and remains forever with the Great Spirit. This is due to the fact that their life was righteous and life committed to performing their duty. The main postulate in Old Faith is the witch credo “An it harm none, do what you will” – (do what you want, just do no harm). For clarity any Wiccan regardless what branch he belonged, had no right to cause any harm (spiritual, physical, emotional), except in case of self-defense. Each Wiccan believes in the law of three ( “The rule of three”), which indicates that the damage given will cause three times more damage. Wiccan of clear mind does not induce black magic (he is not a suicide bomber!) . This is shortly of what is “Wicca”, and in particular the Old Faith. This small amount of information gives a superficial vision of what is Crafts. Below is the short version of The Wiccan Rede.